The "crafting" label above the 2x2 grid in the player inventory was removed because the sizing didn't work in non-English languages. Fixed white wool/carpet appearing just as "wool" and "carpet". "Beam Me Up" achievement works again. Good news for elytra fliers - you can now shoot yourself with a bow and arrow (and can splash yourself with potions again, too! Fixed smoke/water particles flying off at crazy speeds. Hostile creatures can again hit with melee attacks against mounted players. Fixed a crash when downloading texture packs from the Global Resources or Resource Packs tab. Fixed a crash that could occur when trying to access XBL. Hitting an Enderman with a potion of invisibility no longer also makes the block it is holding disappear. Text in buttons in the Realms update screen should now be properly aligned. Mobs no longer get stuck in corners of fences. 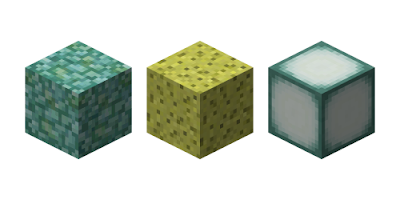 Slimes & Magma Cubes again have the correct movement. The /say command in command blocks no longer gives an incorrect message. Shulker boxes drop one shulker box when mined with a silk touch pickaxe. All mobs should now be affected by the speed effect. "Diamonds to You!" achievement again unlocks in multiplayer. Fixed a crash that happened when selecting the Power Rangers skin pack. Anvils no longer drop as items when they fall on torches - and they stack now, too. Multiple coin offers are no longer highlighted at once when navigating the Marketplace with a controller. Cave spider spawners now generate more often in abandoned mineshafts. Fixed a crash that occurred when chests & cauldrons collided with each other. Increased the speed and range of the Evoker's Fang attack. Template worlds will once again appear on the create world screen. Rideable mobs can only be ridden when equipped with a saddle. Fixed texture orientation on command blocks. Fixed "Broadcast to LAN" not toggling off. Various layout adjustments to the Marketplace screen. Pressing 'Enter' on the keyboard will now move to the next line when making a sign (Android only). Fixed 0xfe RakNet wrapper packet compression. Lava will no longer flow towards drops it cannot reach. Once again have fixed mobs going out of fences when reloading a world. Fixed the "Leave Boat" button missing from the screen. Fixed the height of shulker boxes. Fixed Totem of Undying lighting issues. Milk buckets will no longer disappear from a full hotbar after milking a cow. Fixed inventory and player icons for Exploration Maps. /Replaceitem will now work with the off-hand slot. You can again craft dispensers using the Pocket UI. Vexes will still have their swords when you reload a world. Fixed a crash when clicking on the "Sign in for Free" button while trying to download game music. All players can now ride mounts when it is on a lead, not just the owners. /locate village command now returns coordinates of the nearest village. All Resource packs should now be displayed in the Global Resource list, both in the settings menu & create world menu. Players are again able to push mobs into minecarts & boats. /fill command changes should now be saved. If you break a melon with shears, you can get the full 9 slices of melon. You can now convert 1 cobweb to 9 strings. Added a warning if a resource pack cannot find the textures list file. Fixed multiple issues with the evoker by refactoring data-driving of the evoker's spells. Mobs can again walk on beds & brewing stands without spinning around or getting stuck. Fixed a crash that happened when loading older worlds. Villagers can now pick up more than a single stack of an item. The Wither is now one of the paintings you can get! Players no longer spawn on the bedrock roof of the Nether. Fixed a crash when equipping items in the off-hand slot repeatedly. Health & hunger bar textures fixed - no longer bugged when using a texture/resource pack. You can again move the scroll bar properly when an item in the Storage manager is expended. Shulker boxes no longer all appear as white in the inventory/hotbar. Magma cubes are no longer missing their jumping animations. Witches are no longer immune to poison damage. Snow golems now attack Vexes. Evoker fangs no longer cast shadows. You can now dye multiple beds. Now blocks are only highlighted in Adventure mode if a player can interact with them. Default creative mode items no longer reappear in your inventory if it's empty after you re-enter a world. The Nether portal overlay no longer appears briefly when using the clear effect command after the nausea effect. Mobs again drop cooked food if killed by an arrow from a bow with the Flame enchantment. Arrows of Healing deal additional damage to undead mobs and no longer bounce. Achievement description text now appears in one color. Villages are fully generating again. Vindicators and Vexes now hold their weapons correctly. Can_place_on & can_destroy adventure mode commands now work as expected. Dyeing a Shulker Box will no longer delete contained items. Fixed the screen getting cut-off on smaller screens for the Redstone Mansion store description. Fixed two bugs causing Android devices to crash. Maps are now numbered so you can tell which map is which! How to join or leave the Beta Testing Program?